On Friday, the Crimson will look to avenge last year's ECAC semifinal heartbreak at the hands of the Golden Knights. Harvard men’s hockey coach Ted Donato ’91 uttered these words in late September, mere weeks before the 2018-2019 campaign began for his squad. For the Harvard program, reaching the ECAC semifinals in Lake Placid, N.Y., is a regular postseason goal. The historic Herb Brooks Arena provides a dramatic backdrop for the four remaining teams as they compete for conference supremacy and an automatic bid to the NCAA Tournament. After a two-game sweep of Dartmouth in last weekend’s quarterfinal round, the No. 12/11 Crimson (19-9-3, 13-7-2 ECAC) can indeed check this milestone off its list of annual objectives. On Wednesday morning, the Harvard icemen bused to the famed Upstate New York Olympic town, eyeing Friday’s semifinal bout with No. 9 Clarkson (24-10-2, 13-7-2). In a rematch of last year’s theatrical clash — in the same round against the same opponent — the Crimson will look to avenge a heartbreaking loss to the Golden Knights and advance to the Whitelaw Cup title game for the fourth time in five years. 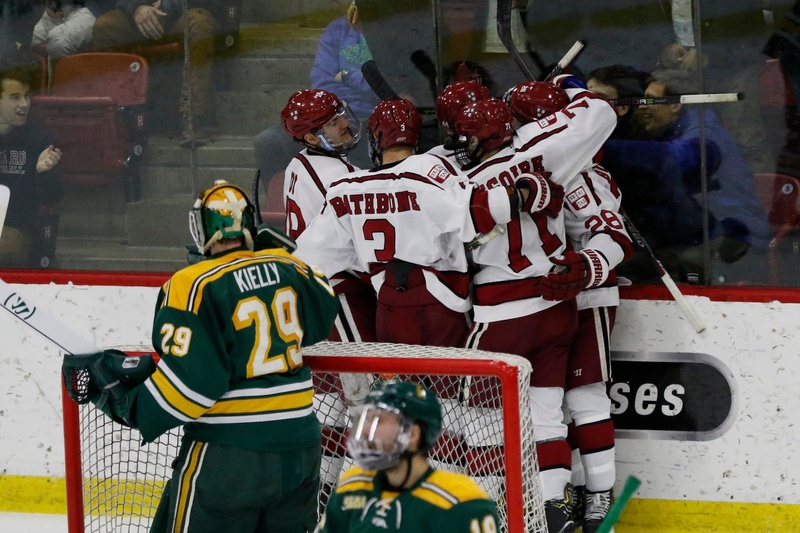 Harvard joins Quinnipiac (2014-2017) and Cornell (2009-2012) as the only programs in the past decade to advance to five consecutive ECAC semifinal rounds. The group is seeking its 11th conference crown all-time and fourth under coach Donato. This year’s trip to Lake Placid offers the Crimson a chance to exact revenge over Clarkson after the Golden Knights ended Harvard’s season in the 2018 ECAC semifinals. For the Crimson, the result was itself crushing; but the nature of the defeat added to the pain. By the mid-way point in the contest, Harvard owned a 3-0 lead. Even when Clarkson scored before the second intermission, the outlook was bright for the Crimson. This outlook got even brighter when, just six seconds into the final frame, Harvard regained a three-score lead. Before the third period was five minutes old, however, the Golden Knights had rallied improbably to notch the game at 4-4. A goal on the rush 12 minutes into overtime sealed the victory for Clarkson, sent a stunned Crimson team packing, and concluded the careers of the program’s seven seniors. As Horton’s words suggest, members of the class of 2018 will live with the abrupt and shocking end to their Harvard hockey careers for years to come. But the 21 members of the 2017-2018 team that continue to don the crimson and white sweater to this day also struggle to come to terms with the painful loss. Friday’s rematch between the Crimson and the Golden Knights will therefore be charged with animosity and intensity from last season’s drama. The regular season failed to separate Harvard and Clarkson. Both squads finished conference play with 13-7-2 records and split their own season series, 1-1. The Crimson gained the upper hand in the first meeting between the teams this year. For the second straight campaign, Harvard earned a pivotal home victory, 4-3, against the top-10 Golden Knights. In late January, sophomore defenseman Reilly Walsh buried a shot off the draw in overtime to snuff out a third-period comeback by Clarkson. The two teams met again three weeks later, this time with the Crimson making its annual “North Country” trip to Clarkson and travel partner St. Lawrence along the New York-Ontario border. The Golden Knights evened the season series with a 5-3 triumph, seizing the game after Harvard starting goaltender Michael Lackey went down with a knee injury. The emotional shock of Lackey’s absence negated the momentum gained from co-captain Michael Floodstrand’s equalizer just seconds before the injury. The senior net-minder has yet to return from his ailment, forcing junior Cameron Gornet to fill in between the pipes. Despite initial concerns that a relatively unproven Gornet would struggle to match Lackey’s stellar play in the crease (14-6-3, 2.23 GAA, .920 SV%), the backup’s play (5-3-0, 2.43 GAA, .920 SV%) has been anything but backup-caliber. Lackey has finally returned to practice this week and will likely be a coach’s decision for Friday’s semifinal contest. Coach Donato has a difficult choice to make, though, since Gornet has been a reliable option for the Crimson in Lackey’s absence. Over the past few seasons, matchups between Harvard and Clarkson have been consistently entertaining, in addition to yielding relatively even results. The aforementioned games, as well as last year’s 6-6 barn-burner at the Golden Knights’ Cheel Arena, have marked some of the most intense and memorable outings in recent program history. Ultimately, the two sides boast lineups riddled with skill, and this talent has taken center stage in the teams’ latest heavyweight bouts. For the Crimson, the most notable game-changer is Fox (9–37—46), whose offensive prowess from the blue line is unmatched throughout Division I. The Jericho, N.Y., native leads the nation in points per game (1.48) and assists per game (1.19) and is fresh off a six-point weekend against Dartmouth that saw him tie Mark Fusco ’83 for the most single-season points by a Harvard defenseman in program history. 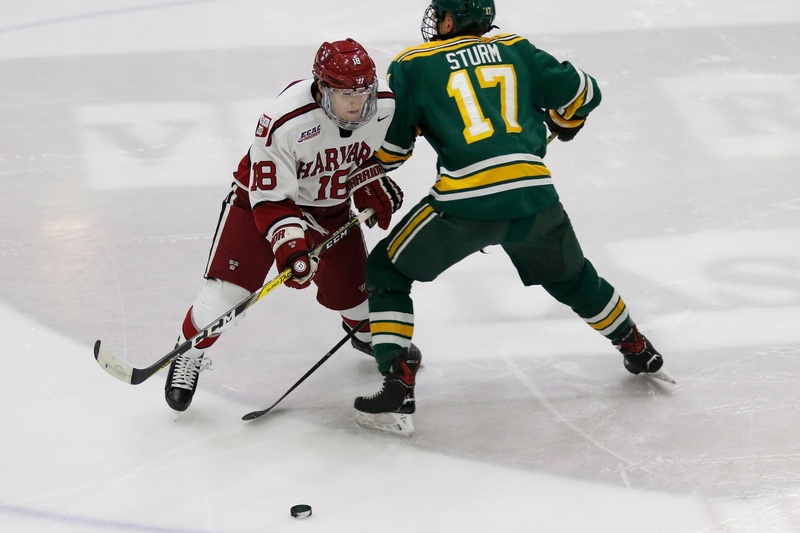 Harvard's Adam Fox and Clarkson's Nico Sturm were both named finalists for the ECAC Player of the Year and will square off on Friday night. On Wednesday, the junior was named a Hobey Baker Award Top 10 Finalist, and it would be thoroughly unsurprising if the Crimson’s powerplay quarterback made the final three nominees for college hockey’s most esteemed accolade. With another productive weekend, Fox could become the first defenseman since Wisconsin’s Brendan Smith to eclipse the 50-point plateau. Fox, who has registered 19 points (2–17—19) in his last 10 games, is undoubtedly the primary focus of Clarkson’s defensive gameplan. Also on Harvard’s back end, Walsh (12–19—31) and freshman Jack Rathbone (6–15—21) provide offensive firepower. Walsh’s one-timer on the powerplay has been lethal all season, and Rathbone is heating up at the perfect time, logging at least a point (2–5—7) in each of his last six games. A trio of underclassmen lead the Crimson forward corps: freshman Jack Drury (9–15—24) centers sophomore Henry Bowlby (5–8—13) and fellow rookie Casey Dornbach (7–22—29) to form the team’s top line. Both Drury and Dornbach recently were named to this year’s ECAC Hockey All-Rookie Team, with Dornbach receiving Rookie of the Year honors. Zerter-Gossage (18–6—24) leads the team in goals after providing versatility this season for coach Donato, completing lines both down the middle and on the wing. His timely goals have propelled Harvard to victory on numerous occasions. In terms of production, the Golden Knights are led by their co-captains, juniors Nico Sturm (14–29—43) and Devin Brosseau (12–13—25), and Latvian-born junior forward Haralds Egle (17–20—37). Sturm, in addition to his lofty point totals, was deemed the ECAC’s Best Defensive Forward for the second consecutive season. He is also a finalist for conference Player of the Year, along with the Crimson’s Fox. Adding to the strength of the Golden Knights’ junior class, goaltender Jake Kielly (24-10-2, 1.90 GAA, .929 SV%) has been a looming presence in net all year. While Kielly’s career numbers against Harvard (2-4-1, 3.82 GAA, .881 SV%) are lackluster, he sits near the top of the NCAA in almost every major goaltending category and is as large a reason as anyone for Clarkson’s success in the past several seasons. Another junior, rearguard Greg Moro (5­–15—20), is a steady contributor from the blue line and was named a finalist for the ECAC’s Best Defensive Defenseman award. Underclassmen also pitch in up front for Clarkson. Shifty sophomore forward Jack Jacome (5–18—23) has reliably inflicted damage on Harvard, scoring eight points (3–5—8) in his five career games against the Crimson, totaling at least one in each meeting. Freshman Josh Dunne (14–7—21) leads the team in goals per game (0.48) and has potted a puck in each of his last three outings. The Crimson may benefit from the extra time and space allotted by the Olympic-sized ice sheet at Lake Placid's Herb Brooks Arena. While each team certainly wields an excess of skilled players, the Crimson stands to benefit arguably more than the Golden Knights from the Olympic-sized ice sheet at Herb Brooks Arena. With more time and space with the puck, an already offensively gifted Harvard squad becomes even more dangerous. Both Harvard and Clarkson possess favorable rankings in the PairWise, the selection tool for the NCAA Tournament, coming in at 12th and ninth, respectively. In short, barring an unlikely series of results this weekend across multiple conference tournaments, both teams have already earned spots in the 16-team bracket at the end of the season. As of Tuesday, College Hockey News’ PairWise Probability Matrix gives the Crimson a 98 percent chance of making the Tournament, while it suggests that the Golden Knights’ bid is certain at this point. 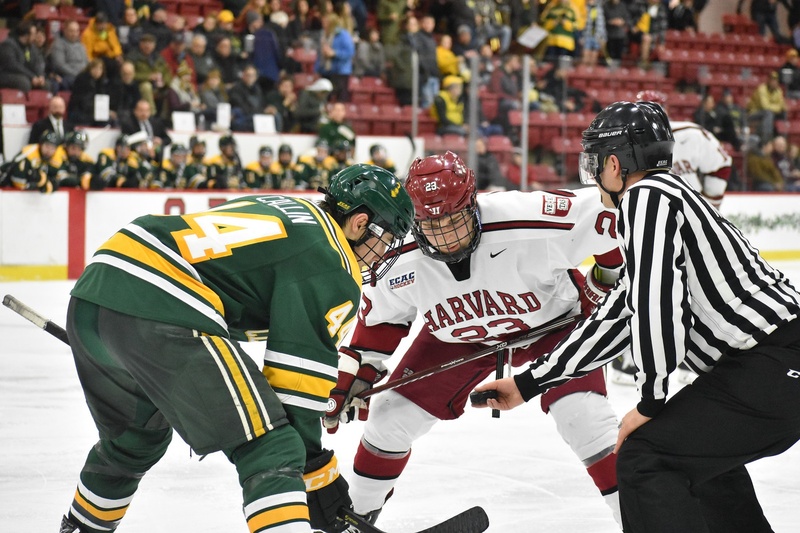 Given this reality, a conference title this weekend is not imperative for Harvard to reach the Division-I bracket: considering the quality of Clarkson’s team, even with a loss on Friday the Crimson’s PairWise ranking would only narrowly diminish. Nevertheless, an ECAC crown would ensure a tournament berth, leaving nothing to chance, and allow Harvard to jockey for a higher seed in the bracket. So this year’s trip to Lake Placid means as much as any for the Crimson. Win or lose this weekend, it is crucial for Harvard to be playing its best hockey leading up to the NCAA Tournament. A pair of victories against proven conference foes will only help the group’s experience, confidence, and seeding ahead of the Tournament draw.